I remember hearing a story on NPR last year about a book, “The Rise of the Rocket Girls” which told the story about women who had been recruited into service at NASA’s predecessor agency, The National Advisory Committee for Aeronautics (NACA) to perform mathematical calculations before computers were commonplace. I thought about reading that book, but I quickly forgot that thought. Almost a year later, part of that story arrived in my inbox, courtesy of my alma mater and the WVU Alumni Association. The story that I am linking to today for WATWB is about Katherine Johnson. 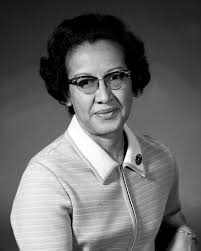 Katherine Johnson is a black female physicist and mathematician. A fellow graduate of WVU, a leader in the work that put men into space and, on the ill-fated Apollo 13 mission, helped bring them safely home. She is also a recipient of the 2015 Presidential Medal of Freedom award. Johnson worked on the early space program, including computing the launch window for astronaut Alan Shepard’s 1961 Mercury mission. She authored a textbook on space math. She was so well-respected for her work, that John Glenn, whose orbit around the earth was calculated by computers, asked her to double-check the computer’s calculations. It sounds absurd to say that I am proud to be connected to a university that did not deny Katherine Johnson an education. However, in the late 1940s, it was hard enough for women to get educated, let alone black women. In the 1950s and 60s, it was primarily government agencies that were hiring women and minorities for professional positions, and in the early 1950s, Katherine was still being forced to work in segregated offices. Katherine’s story is one of achievement, purpose, service and contribution. She is not angry or bitter. She is proud of her service to NASA, but is quick to point out that she was part of a team. I can’t begin to count the number of lessons we can learn from this remarkable woman. The “We are the World” Blogfest is in its third month of a year-long journey. 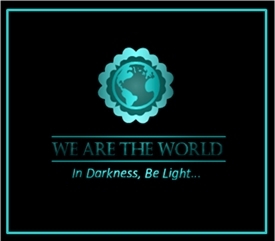 This blogfest’s goal is to spread the message of light, hope and love in today’s world. We are challenging all participants to share the positive side of humanity. This month’s co-hosts, Emerald Barnes, Eric Lahti, Inderpreet Uppal, Lynn Hallbrooks, Peter Nena, Roshan Radhakrishnan, welcome participants and encourage all to join in during future months. #WATWB is a blog hop on the last Friday of every month. Click HERE to check out the intention and rules of the blogfest and feel free to sign up at any time between now and February of 2018. Katherine G. Johnson being honored at the Virginia Air and Space Center. Former NASA mathematician Katherine Johnson is seen after President Barack Obama presented her with the Presidential Medal of Freedom, Tuesday, Nov. 24, 2015, during a ceremony in the East Room of the White House in Washington. Photo Credit: (NASA/Bill Ingalls) Johnson’s computations have influenced every major space program from Mercury through the Shuttle program. Johnson was hired as a research mathematician at the Langley Research Center with the National Advisory Committee for Aeronautics (NACA), the agency that preceded NASA, after they opened hiring to African-Americans and women. Johnson exhibited exceptional technical leadership and is known especially for her calculations of the 1961 trajectory for Alan Shepard’s flight (first American in space), the 1962 verification of the first flight calculation made by an electronic computer for John Glenn’s orbit (first American to orbit the earth), and the 1969 Apollo 11 trajectory to the moon. In her later NASA career, Johnson worked on the Space Shuttle program and the Earth Resources Satellite and encouraged students to pursue careers in science and technology fields. Thanks Judy. I give a lot of credit to her parents, too, for working so hard to get her an education. She showed string math skills at a very early age. She graduated from college at 18 ! A brilliant and honorable woman! I’m glad their story is being told now before they’re all gone from us. Thanks! As far as I can tell, she is still among us, and she’s still helping to encourage young women to careers in STEM related fields. So many people we don’t know about that we should. Great post, Dan. Thanks Lois. I’m glad someone gave me a second chance to learn about her. I heard about the movie first before the book. Myself I was astounded that space mathematics used to be done by hand. Thank you, Dan, for sharing the story, and for participating in the #WATWB. Thanks for co-hosting, Peter. I love the stories that are coming out of this effort. Apparently, this woman had a mind made for math and understanding space. A remarkable gift that she managed to apply where it was most needed. I remember, when we started a business back in the 1980s building bank trading room systems that I checked all of the formulas we were given to ensure that they were correct. This meant disassembling the transactions and rebuilding them into a tight mathematic formula. It is a great feeling to do something like this and find that it is right. I have put “Rise of the Rocket Girls” on my Amazon wish list. I’m glad you enjoyed and can relate to this story. I have been in this business long enough to remember real math challenges that computers couldn’t quite handle (yet). Those days didn’t last long, but long enough for me to have to remember how to do some things by hand. For the record, we are, once again, rewriting a system at work that deals with somewhat complicated foreign currency transactions. We still have to work them out by hand to make sure we have the code correct. I remember reading about the origin of the word “computer” and ran across this. After the French revolution, the mathematician Gaspard de Prony set about the task of generating standard trigonometric and logarithmic tables. He broke the job down into discrete parts and assigned each sub-task to a group. The third group consisted of sixty to eighty human computers. These had no more than a rudimentary knowledge of arithmetic and carried out the most laborious and repetitive part of the process. Many were out-of-work hairdressers, because, with the guillotining of the aristocracy, the hairdressing trade, which had tended the elaborate hairstyles of the elite, was in recession. Talk about your unintended consequences – out-of-work hairdressers turning to math to make ends meet? Who’da thunk it? Brilliant post, Dan — to of my favorite non-fiction subjects, NASA and women in technology’s history. Well done. Not to be a killjoy but… I tried to Google it last time and saw a lot, but nothing that sounded right. What words does the acronym represent — WATWB? Have a good Memorial Day weekend. Hugs. “We Are The World” Blogfest – The last Friday of every month, until February 2018. We are asked to share a good news story each month. Sometimes, it’s hard to find one! I seem to be focusing on women. It wasn’t intentional, but my first three month’s have featured news stories about women in history. I may try to continue the trend, because I think women are under-reported in history, especially in science and technology, but not necessarily because they didn’t contribute. Thanks JoLynn. She really is remarkable. Nice choice. I’ve read about her before somewhere, but who could tire of reading the accolades of such an incredible person? She was a pioneer in so many ways. Thanks. I think she has had a remarkable life. I’m glad her story has been told. This is indeed a woman to honor and celebrate. Thanks for sharing the story. I’m glad you enjoyed this woman’s story, Deborah. I recently bought HIDDEN FIGURES, but haven’t read it yet. Now I have another book for my TBR list! Yes, that’s the other book that includes her story. I’ve added these to my reading list as well. I enjoyed this post, Dan. Always a good idea in bringing recognition to those who deserve it. Thanks John. You can’t go wrong with an early space geek. What a neat story, and brilliant woman! Imagining how big, and complex those math problems were is mind boggling! Plus, I’m sure those early computers were pretty hard to work with. Whoa – her areas of expertise are totally out my league,b but very interesting to read! Thanks Dan! This woman has probably forgotten more about math than most of us will ever know. And, good lord, if you asked a kid to do a math problem the way she did, with pencil, paper, and a slide rule, they’d run away screaming. I still have my slide rule but I don’t think they’re making any replacements, John. I’m glad you enjoyed this. There were many of these women, and it took a long time for their story to be told. Thank you for this post. Katherine Johnson is a role model. Oh, I know what it was like. I was born and raised in Huntington, WV (Go Marshall and the Thundering Herd) in the 50’s and 60’s. Huntington, like Morgantown, was the ‘big city’. You didn’t have to go more than 20 miles to see a different life. I went to high school with someone much like Katherine Johnson. It is pretty exciting that Katherine is from your alma mater! I’m happy to learn that you’re from WV. I haven’t met too many people who understand that part of the country. She graduated about 30 years ahead of me, but I still (want to) feel a connection. Of course you do. What a great connection. As to WV, most people here in New England really don’t understand or know that part of our country. Almost heaven. The one organization I support, only one in the country devoted to reading-aloud to children as opposed to giving away books, is in WV. Best to you, Dan. I love her story and that of the the other women in Hidden Figures, the film about the women mathematicians and engineers at early NASA. It was so inspiring to me. They overcame so many obstacles, racism and sexism. Katherine Johnson was a gifted student and thank goodness she had people who realized and saw that she got the right education. Her story and the stories of women like her are so important. Thanks Deborah. Imagine working as hard as her parents did to get your child educated. I need to see that film. It is a nice film. It is based on a book as well. I want to check out the book. I cannot imagine the amount of effort it took to grind through spaceflight calculations in the time before modern computers. What an amazing mind and what an amazing woman! Apparently, she had a mind wired for math and physics. Still, I agree with you, it’s hard to imagine doing the work, especially knowing the consequences of making a mistake. Such a pionneer woman. I almost always read the book before the movie but this time I saw Hidden Figures first. My hope is that this excellent movie will put Katherine Johnson (and any other woman with such under appreciated skills for too long) to the spotlight. Great post, Dan. Thanks Evelyne. The book is up next for me. I’m glad she lived long enough to receive the award and the attention she deserved. Thanks Hilary. I need to read the book. I’m less of a film guy, but if I ever have the chance I would watch that. Now, more than ever, we need to remind the world about brilliant minds such as this one. It seems that today it has become a bad thing to be *smart*. Scientists and other educated people are under attack as “elitists”. To counterbalance it, we need more wonderful stories like this one. Intellect needs to be nurtured and celebrated. It does! You’re so right Joanne, intellect is under attack. I had recently seen the movie as well…. She is truly remarkable. Thank you for sharing. Thank you. I haven’t seen the movie yet. What a story. Women who do science face great discrimination and women in minorities more so and women of that generation! I can’t even begin to imagine the odds this lady must have faced and it is her indomitable spirit that helped her overcome all odds. The next time I reach out for my calculator, I will remember that there was a life before digitalisation…. Ha ha – I remember reaching for a slide rule. I also remember how little we heard about women in science, even in the 60s and 70s. Actually, it isn’t that much better today. It’s a shame. She had a lot to offer, as so many women do today. Thanks for sharing Simon’s Still Stanza #WATWB Ha ha – I remember reaching for a glide normal. I loved “Hidden Figures” (bought and read the book after I saw the movie). I think I saw it three times because I kept making different people go with me to see it. It’s an amazing bit of history.